Chester Clark III--Challenge, Unashamed? Which Cloud are You In? 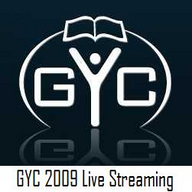 Generation of Youth for Christ (GYC), formerly General Youth Conference, is a grassroots Adventist movement organized and led by young adults from diverse backgrounds. Through the networking, communication, and organization provided by GYC, young people are encouraged to experience revival and reformation and to work hand in hand with the Seventh-day Adventist church in taking the Three Angels' Messages to the world in this generation. Our theme for 2009 is “unASHAMED” based on Romans 1:16, "For I am not ashamed of the gospel of Christ..."